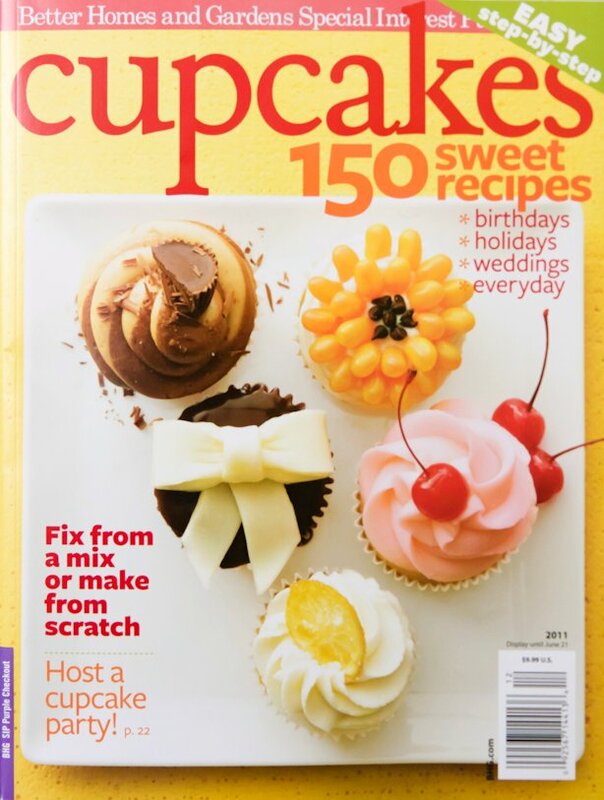 Tia gave me this magazine all about cupcakes from Better Homes and Gardens. 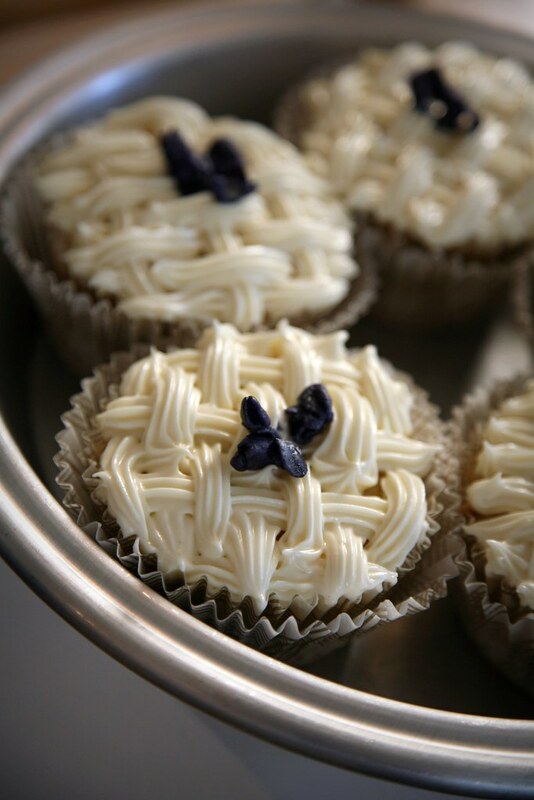 I bookmarked a recipe for Lavender-Honey Cupcakes that I thought would be great to make on Easter because the lavender is blooming like crazy in Spring and the basketweave piping they showed on the cupcake in the magazine was appropriate for obvious reasons. 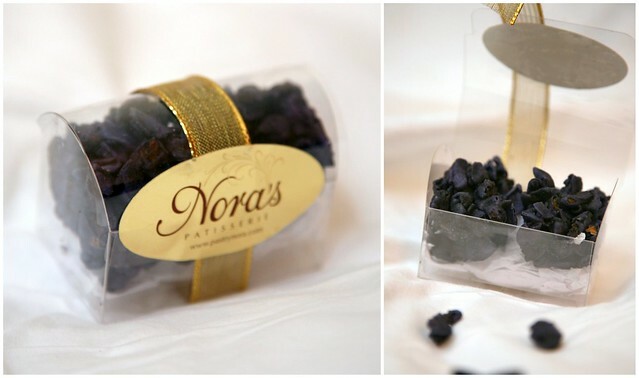 It was also an opportune time to use the candied violets that Tia got from Nora's Patisserie. 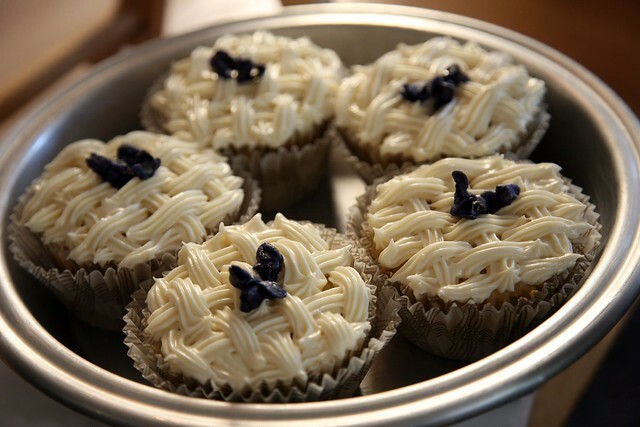 They came out pretty good -- although the cupcakes themselves were a tad heavy for my taste. The frosting was great. I loved the way they looked with the candied violets. 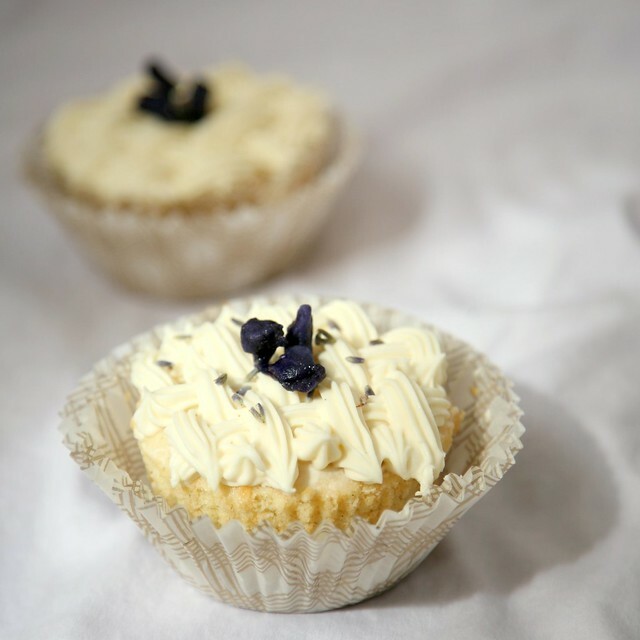 Plus they taste yummier than dried lavender sprinkles (in my humble opinion). We brought them to Alex's mom's house for a lovely Easter Dinner. Line eighteen 2 ½ inch muffin tin with paper baking cups. Preheat oven to 350 degrees F.
In a medium bowl combine flour, baking powder, lavender, and salt. Set aside. In a large mixing bowl, beat butter with an electric mixer on medium high speed for 30 seconds. Add sugar, honey, and vanilla; beat until combined. Add eggs, one at a time, beating well after each addition. Alternately add flour mixture and milk to butter mixture, beating on low speed after each addition just until mixture is combined. Spoon batter into cups, filling each about three-fourths full. Bake for 16 to 18 minutes for 2 ½ inch cupcakes or until a toothpick inserted in centers comes out clean. Cool cupcakes on wire racks for 10 minutes. Pipe with Honey Frosting. If desired, sprinkle with additional lavender or candied violets. Makes 18 (2 ½ inch) cupcakes. Allow cream cheese and butter to stand at room temperature for 1 hour. In a large mixing bowl beat cream cheese, butter, honey, and vanilla with an electric mixer on medium speed until light and fluffy. Gradually add 1 cup of powdered sugar, beating well. Gradually beat in 1 ½ to 2 cups additional powdered sugar until frosting reaches a piping consistency. Makes about 1 ⅔ cups.